BOSTON — Massachusetts is leading the New England states in securing energy produced from resources such as the wind and the sun, as it tries to meet legislative mandates for renewable energy. But the commonwealth is also part of a coalition of states considering massive bids for renewables that could reshape the New England energy market. This week, Massachusetts utilities opened up initial bids from wind power generators for contracts that would last as long as 15 or 20 years. The contracts are for some 4 percent of the state’s total electricity load. The state is trying to save consumers some money, according to Rick Sullivan, Secretary ofEnergy and Environmental Affairs. Sullivan’s agency actually accelerated the timeline for getting the new energy bids in, with final approval expected by fall. That’s because a significant federal tax credit for wind projects ends this year. A big contract for Massachusetts electricity would help companies such as Boston-basedFirst Wind or Spain’s Iberdrola secure those credits before they go away. Collectively, the credits could reduce costs for Massachusetts consumers by hundreds of millions of dollars, industry players say. And, just as importantly, long-term contracts would help companies get construction loans. “They reduce the cost of borrowing for the renewable energy developers, and those savings are passed along to ratepayers,” said Conservation Law Foundation analyst Sue Reid. She was part of a group that lobbied the state to go with long-term contracts. “There’s no question that when you go long, it delivers benefits to ratepayers and developers alike,” she said. Reid and other stakeholders say Massachusetts is ahead of the game — and a pile-on may be underway. A bill pending in the Connecticut legislature would get that state into the mix in time for the federal tax credits. And now there’s an effort to band all the New England states together for a joint procurement of renewable energy, creating a big market-mover that could bring even more stability to the sector. 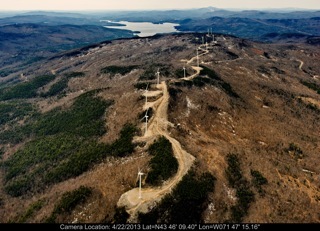 It would take hundreds of new wind turbines — mostly in northern New England — to meet the Massachusetts contracts. Connecticut’s would require hundreds more. Add in a multistate effort down the line and you start to see big change in the wind, said Eric Thumma, policy director for Iberdrola Renewables. It is relative. As Thumma noted, the Northeast’s wind industry is dwarfed by the Midwest’s giant wind farms. And there are costs, of course. In addition to the federal tax credit, states, including Massachusetts, give subsidies to wind and other renewable energy developers to help meet environmental goals. In 2012, state regulators estimate those subsidies added about $25 to a typical residential electricity bill. And the hit is bigger for energy-intensive industries.